“He knows what he wants to do and his love for the wilds will make another Tom Thomson of him. […] There is not a Canadian artist, dead or living, who has drawn or can draw in 5 minutes sketches to compare with those of Richard,” wrote Clarence Gagnon from Paris on March 14 1928, about René Richard to Eric Brown, Director of the National Gallery of Canada. Alan Klinkhoff, June 2016 - The René Richard paintings reproduced here are excellent examples of his work, confirming his stature as an important and genuinely original Canadian artist of his generation. "His style is clean and firm, his brushstrokes harsh and true", wrote Clarence Gagnon of his protégé. René Richard’s œuvre is in part a first-hand description of the life of a Canadian trapper traveling by canoe, on foot or dog sled in the wildernesses of Alberta, Saskatchewan, Manitoba, the Northwest Territories and later in Quebec. His work is an important contribution to the western Canadian narrative and is, as far as we are aware, one not previously described professionally and artistically by an actual trapper, a trade heralded in the history of the development of Canada. Richard has long enjoyed iconic stature in Quebec but his significant ethnographic works of quality are also relevant to a Canada-wide audience, making him a painter of great national historical importance. In 1909, Richard emigrated with his parents to Canada from Switzerland. After two years in Montreal, the family moved to the remote and isolated area of Cold Lake, Alberta, where his father operated a trading post, selling supplies to indigenous peoples in the region and receiving furs as payment. The exposure to life in the great outdoors seduced Richard in his early teens. 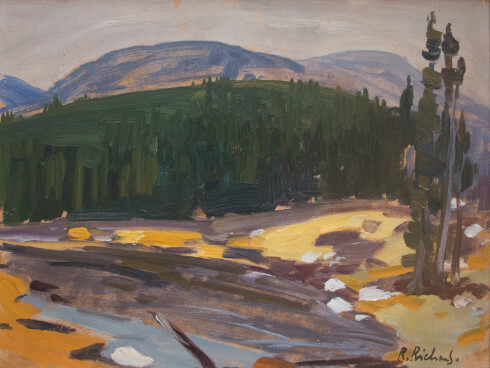 He spent the better part of 16 years as a trapper in Western Canada and the plein-air sketches he made during his wilderness expeditions would provide him with lifelong inspiration. His drawings of this period depict the unique experiences of the Canadian trapper and woodsman, of abandoned camps, the woodsman’s canoe, the burning campfire, the trapper’s sled dogs, and the occasional glimpses of the camaraderie between trappers. His landscapes from this period, rarely titled or, if so, with generic titles like ”Encampement indien”, are often misconstrued as Quebec vistas. In fact however, he regularly used as reference the fine drawings of his earlier trapping days in the 1930s in Western Canadian, areas including the Churchill River, Fort McMurray and Jasper regions. 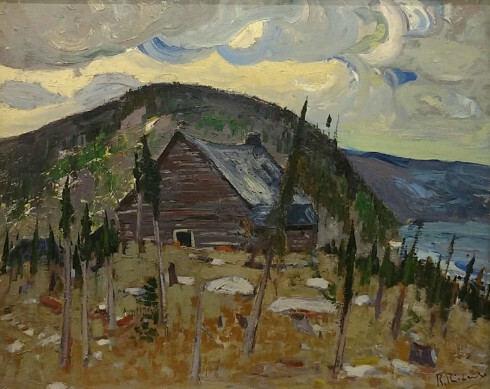 Of course, his legacy also boasts a strong and extensive body of work depicting the Charlevoix area where he delighted in the landscapes of Ungava, the Saguenay River, and the Quebec North Shore. René Richard as artist and trapper was further mythologised by Manitoba-born novelist Gabrielle Roy who was Richard’s friend and neighbour in Charlevoix. She modeled Pierre Cadorai, the protagonist of her acclaimed novel La Montagne secrète (1962), on René Richard, hailing the legendary figure he embodied and illustrating the nature of the artist’s quest for creativity, the patient search for meaning in art and in life. Roy portrays the painter’s nomadic and solitary years surrounded by nature, sometimes friendly and often inhospitable, his rare encounters with others in the mythic landscapes of the Great Canadian North, and the slow mastery of his art.